A set of phasors and sine oscillators with phase reset/sync and phase modulation. These were "leftovers" from a request, and have basically only been moved into the drj/osc folder and published. Wow, that was quick! Many thanks! Ah... silly thing done during a clean up pass. Fixed now. Thanks for the report! Two 16 bit readers (one is interpolated), two 32 bit readers, and an LFO which can be synced to a clock pulse or to MIDI clock. 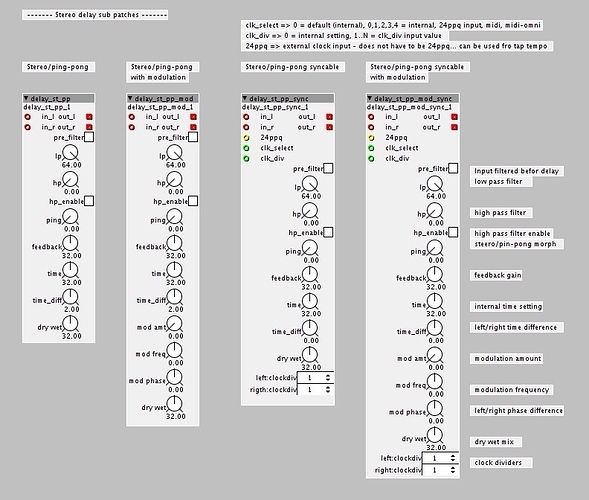 The modules are phase locked to the sync source. The delays have both an absolute time input (as for the original delays) and a proportional time modulation input. The 24PPQ clock input doesn't have to be 24 Pulses Per Quarter note - it's just labelled that way for the sake of convention. 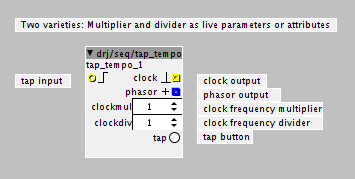 The MIDI and 24PPQ clocks can be divided down using the clockdiv parameter. The emphasis is on performance controllability and fun factor. 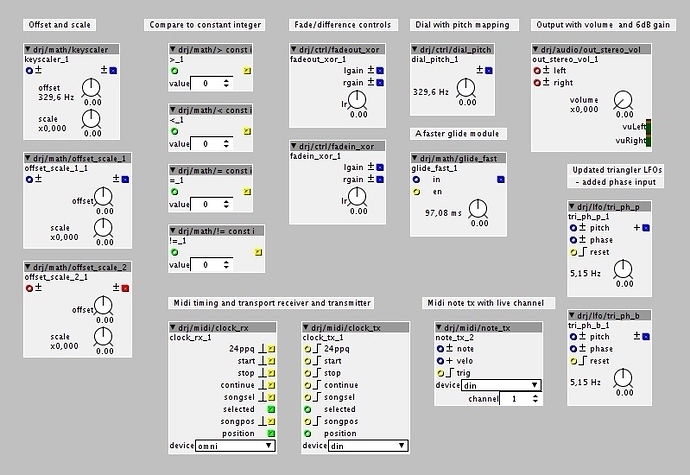 Therefore every control is accessible so it can be bound to MIDI CC, either on knobs directly or via control objects connected to the performance inputs. The core is the sequencer clock controller. This controls the how the steps are played in a number of ways. The clock is syncable to MIDI or to a clock pulse input, as well as having an internal clock. 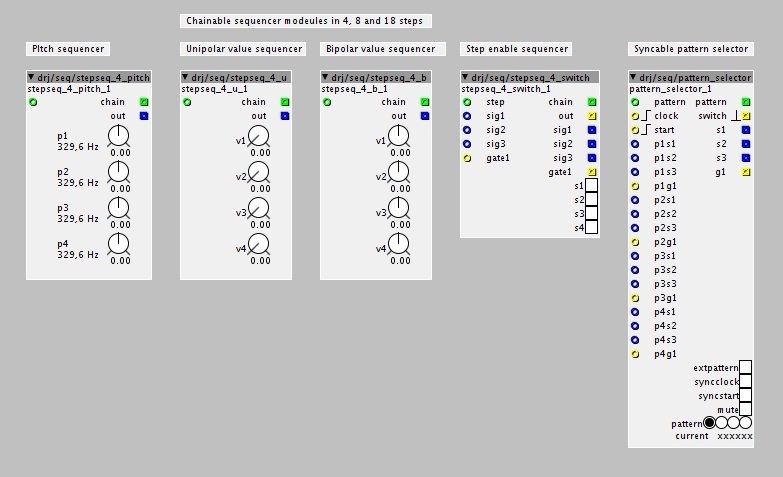 The sequencer step value blocks use dials in order to make them CC assignable. This is a set of 'studio' style stereo delay effects. The come in four variants to cover modulation and midi/clock sync. The default max delay time is 1.36 seconds - edit the sub patch to change that. Using axoloti for MIDI syncable stereo/ping pong delay? Setting parameters from module code can be done to a degree, but not reliably (the issue of parameter access is being discussed elsewhere). The method you describe could be implemented, but the buttons would not reflect the step enables taken from the dedicated input. An alternative module could be made for this, not using the current button parameters, but making a switch module that is meant for external control. It could have a display to reflect the state of the switches. 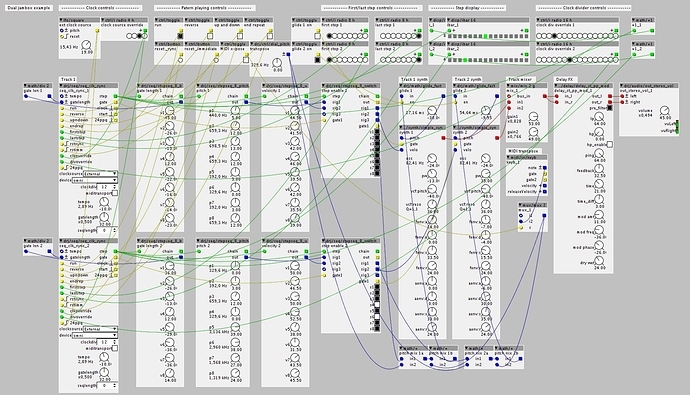 In that case the design is open for implementing your suggestion and any useful additions, while still being controllable by MIDI CC (an explicit goal of these modules). One could also use momentary buttons for toggling the step enables and then use a display element to reflect the states - that would accommodate your suggestion while keeping the display up to date. It could have a display to reflect the state of the switches. how could that be done,practically ? 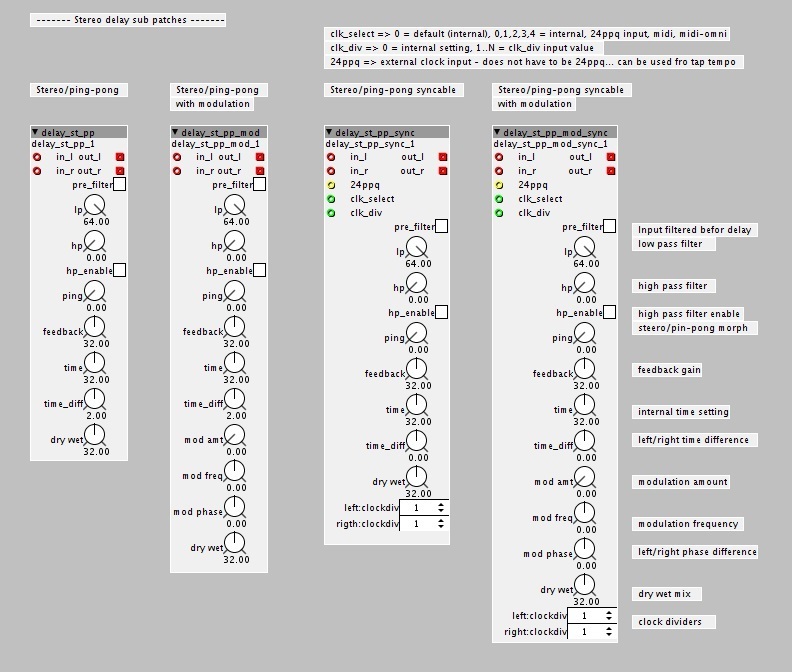 LFOs with PWM outputs and pitch, phase, pulse width and reset inputs. 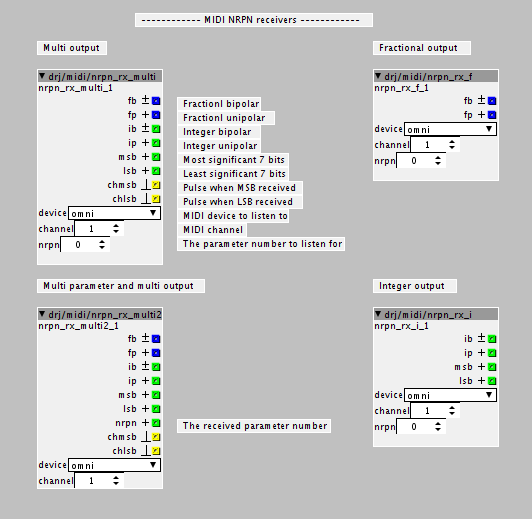 A set of MIDI Non Registered Parameter Number receivers. The "multi" variants are for advanced use where on might want some or all of the value formats, as well as triggered reception. The chmsb outputs generates a pulse when the MSB portion of the NRPN value is received, and the chlsb output generates a pulse when the LSB portion of the NRPN value is received - the latter indicates the complete reception of a 14 bit value, when both the MSB and LSB values have been received, and can be used to ensure the integrity of the full 14bit discrete value. The multi2 variant receives all NRPNs and has an nrpn otutput to indicate the last received one, whereas the other variants receives only the NRPN set by the nrpn attribute. Multiplies and divides a clock signal by the set factor. Both modules are phase locked. This is a pair of Tap tempo clock generator modules. 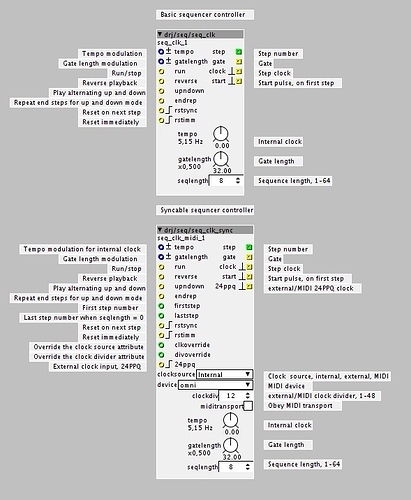 The tapped tempo is multiplied and divided by clockmul and clockdiv. If you want e.g. a 24 PPQ (Pulses Per Quarternote) clock and want to tap 4ths, set clockmul to 24, set clockmul to 12 for tapping 8ths etc.. The tempo can be tapped using the built in button and by using the boolean tap input. The tapping is set to time out after 5 seconds to avoid super slow tempos on the first tap in a series. 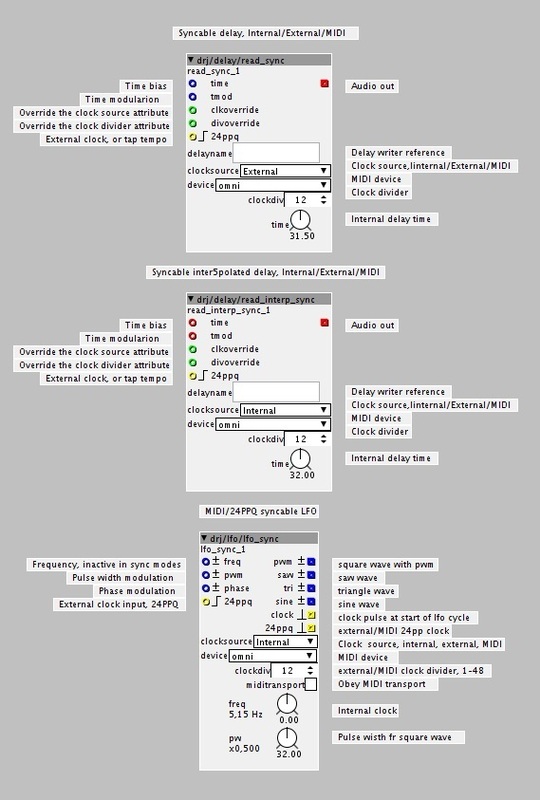 The clock output emits pulses at the tapped tempo * clockmul / clockdiv. The phasor output emits a positive ramp at the same frequency. Note: the other _sync series modules can be tapped by setting the sync source to external and "tapping" the 24ppq (clock) input. 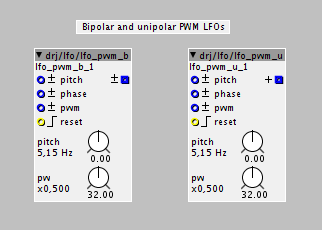 This is a set of LFOs with selectable waveform and selectable bipolar/unipolar outputs. One of them is clock/MIDI syncable. Two of them have quadrature outputs at 0 and 90 degrees. 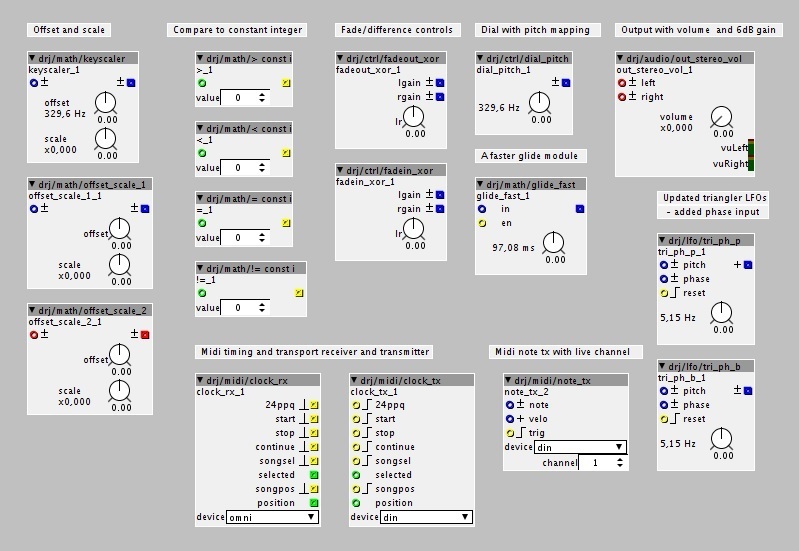 All have pulse width controls for the square wave and bipolar amplitude controls. Hi. 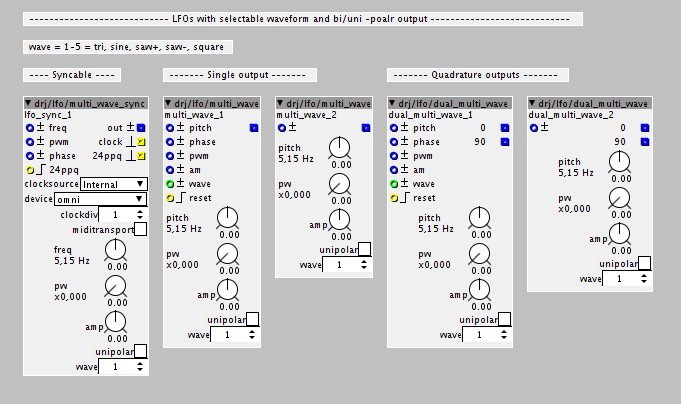 Just testet out the syncable multiwave lfo. I could get it to lock to external midi sync, but never on beat. Sorry for being so ignorant, but I still got some problems. I set the device to OMNI. Clock source to MIDI. 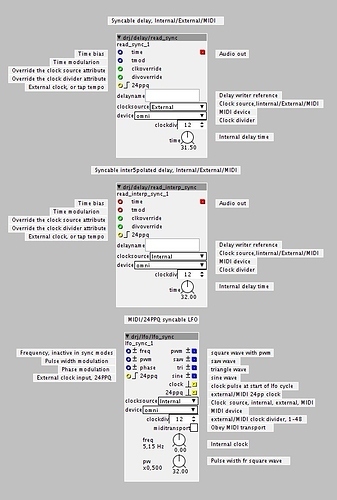 In pro tools i enable midi beat clock for the axoloti. I have nothing connected to the multi wave 24ppq in, since my logic tells me that it pics up the clock internally. I then load up the patch. Press play in pro tools and eveything seems to lock fine. I then press stop, and press play again, and the sync lock is way off. I have the clockdiv set to 24 to give me a good 4 to the floor LFO modulation, with a square wave from the multi lfo, modulating an osc.